Looking Back: What Were the Political Issues in 1918…er…1917? The Second Regular Session of the Seventy-first General Assembly is underway. Based on recent media coverage and the opening day remarks by legislative leadership, we know that some of the anticipated hot topics are funding for roads and bridges, teacher shortages, addressing opioid addiction, affordable housing, health care, rural broadband access, and shoring up the Public Employees’ Retirement Association. And people are hoping to address all of these issues in a spirit of bipartisanship in order to find workable solutions. We thought it would be interesting before we get too caught up in the 2018 session to look back and see what was happening in the 1918 session. What issues were our legislative forebears tackling one hundred years ago? Turns out, in 1918, they weren’t tackling anything legislatively. Before voters amended the constitution in 1950, the General Assembly met regularly every other year in odd-numbered years. 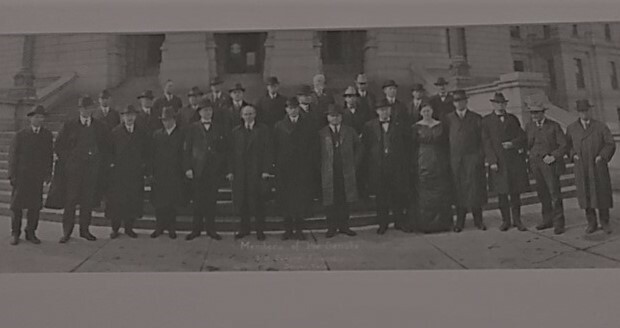 They met in even-numbered years only if the Governor called them in to special session, which Governor Julius C. Gunter did not do in 1918. Not that there wasn’t a lot going on in Colorado in 1918: the federal government broke ground on “World War I Army Hospital 21,” later renamed Fitzsimons Army Hospital; the Broadmoor resort opened in Colorado Springs; the Influenza Pandemic of 1918 started in Colorado in September, ultimately killing nearly 8,000 Coloradans; and World War I ended on November 11. Not to be deterred, we decided to see what the General Assembly was considering 101 years ago, when they convened in 1917 for the Regular Session of the Twenty-first General Assembly. In 1917, the Democrats controlled both the House of Representatives and the Senate. They held the Senate with 18 Democrats to 17 Republicans and the House with 40 Democrats to 25 Republicans. The Twenty-first General Assembly convened at “12 o’clock, noon” on Wednesday, January 3, 1917, as required in the constitution at the time. Lieutenant Governor Moses E. Lewis, whose term ended on January 9, 1917, gaveled the Senate to order. 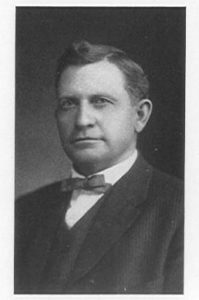 He was replaced by James A. Pulliam, who presided as Senate President for the remainder of the legislative session. We should explain that, under the constitution until 1974, the state’s Lieutenant Governor served as President of the Senate, voting only to break a tie. So, what were the hot topics of 1917? Alcohol and marijuana were both on the list. On January 1, 1916, Colorado became a dry state (Colorado was leading the nation even then). Not surprisingly, in 1917, the General Assembly considered and passed a law to limit the purchase and sale of alcohol to licensed wholesalers and licensed manufacturers. The intent was to ensure that alcohol was used only as a “component part of some manufactured article, and that no article ordinarily used as a beverage will be manufactured therefrom.” The General Assembly also passed H.B. No. 263, carried by Rep. Andres Lucero from Saguache, to “declare unlawful the planting, cultivating, harvesting, drying, curing, or preparation for sale or gift of cannabis sativa,” also known as “mariguana”. The penalty was a fine of $10-$100, or up to 30 days in jail, or both. In his state of the state address, Governor Gunter praised Colorado for its impressive growth in the 40 years since statehood. Population had grown from 60,000 to 1,000,000; assessed valuation had increased from less than $45,000,000 to more than $1,211,000,000; and the total production of the state—$20,000,000 in 1876—had increased several times over due to steel production, sugar output, livestock, minerals, and agriculture. provides for no efficient control or supervision of the schools by any state or county agency; does not provide for equality of opportunity; does not place the burden of support of schools equally on all property; [and] favors the city and town at the expense of the country. 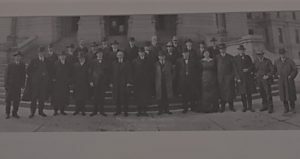 1917 Senate Journal, Tuesday, January 9, 1917, 7th Legislative Day, pg 86. He asked for collaboration in making the school system more efficient and “to properly recognize by salary and otherwise, those giving their lives to this respected and useful calling,” i.e., teaching. Less than a month after the 1917 session adjourned, on April 6, 1917, the United States declared war on Germany and entered World War I. So maybe it’s not so surprising that there were no special legislative sessions called during 1918. Actually, we have been unable to locate a copy of the House Journal for 1917. The order of business presented here is based on the procedures followed on the first day of the 1919 session as presented in the House Journal for 1919.